When was the last time you were consciously aware of how the ecosystem provides services? Whether it is the conversion of carbon dioxide to oxygen, the hydrologic cycle, growing food or recreation, the ecosystem provides services essential to existence. However, people tend to take the ecosystem for granted or, at most, to become aware when something bad happens. This is unfortunate in that it leads to two basic types of outcomes. First, humanity operates in a reactive mode and tends to become cognizant of ecosystem services only when they are either degraded or become altogether nonexistent. Second, people miss many opportunities to leverage these services not only to protect the environment but also to improve lives as well. The good is that society is experiencing a movement toward more proactive and comprehensive ecosystem services valuation. In other words, this includes not only recognizing services nature provides but also giving them a value, including a monetary value, in order to better understand the role they play. The immediate reaction to such a statement may be one of skepticism and cynicism. After all, what right do people have to put a dollar value on a river, tree or wetland? Even if they did, just how would they do it? . . .the price of water varies globally, but in basically every case, that price is substantially below the true value of water. services in order to interact more sustainably with the ecosystem. The World Business Council for Sustainable Development (WBCSD) has issued a Corporate Guide to Ecosystem Valuation to help industry recognize, assess and value those services such that they can be properly integrated into planning and for more informed decision-making. 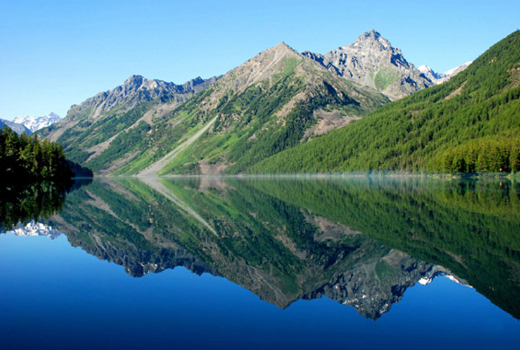 The guide walks an organization through the process of identifying, characterizing and valuing ecosystem services; integrating the results into the organization; and communicating on their ESV efforts. Rather than do a tutorial on the guide, which is readily available online, this article will provide an example of how Veolia Water is taking the concept of ESV to address stewardship of what is likely the most valuable resource, water. The intent is not to simply reduce water to dollars and cents as Veolia recognizes it has priceless value in the human context and is an essential pillar of nature as a whole. But the reality is that water is extremely undervalued throughout the world, even in areas where scarcity exists. True, the price of water varies globally, but in every case, that price is substantially below the true value of water. Veolia’s premise is simply this: Once an organization recognizes the true value of water, which is invariably greater – many times substantially greater – than what people actually pay for it, they will use and manage water much more proactively and sustainably. In the business community, a key element of recognizing the true value of water is being able to assign a dollar value. 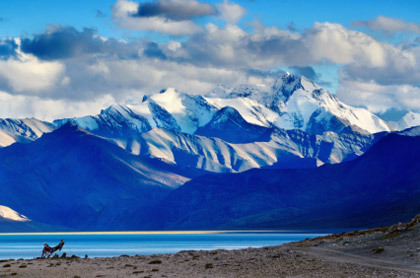 A view of Himalayan mountains with Tso Moriri lake in the foreground in Ladakh, India. Businesses operate on financial parameters in order to survive. Even for activities that are more altruistic, such as philanthropy, supporting social causes and active community involvement, if the company cannot survive financially, it will not be around long to do those good things. Now the “devil is in the details,” as the old saying goes. Calculating a true value of water is not a simple task, and a gallon of water has different values for different organizations, for different uses, in different places. So it is not simply a case of calculating a single, global “true value of water.” Hence, “standardizing” a true value per unit of water is not possible. What can be done, however, is to devise methodologies and approaches that an organization can use to arrive at such a value – for their specific use in their specific case. As selfish as this sounds, it is important for the organization to recognize what the value of water is to them in that it is they who need to take sustainable, resource stewardship actions. Note that this does not preclude a company from needing to know what the value of water is to their stakeholders and local community, if that information helps them with planning and decision-making. Secondly, although this method speaks of companies, there is no reason a public sector entity or other type of organization cannot use the concept of ESV to assess the value of water for their situation. This could include a government agency assessing natural infrastructure risk management and so on. As with ESV in general, there is more than one way to determine the true value of water. At Veolia Water, the company decided to develop a methodology and related tool that allows an organization to logically and systematically determine a true value of water. This is not done as an end in itself. Instead, it is a means to a greater end toward more sustainable water resource management and beyond – toward water resource stewardship. “Stewardship” is more inclusive and broader in regard to stakeholders and watersheds than “management,” which is traditionally more site and organization focused. Risks can be operational, reputational, financial or legal/regulatory. . . For each of these categories, the company should identify all possible scenarios. Veolia’s approach is based on the concept that regardless of how inexpensive water is as to price, there are other “costs,” and there is additional value in regard to what role water plays in the organization. Thus, the implications of this true value may never be realized or even known unless something happens. So, the first step is to recognize the water-related risks that an organization faces. Each of these risks, if they happen, can impact the viability and stability of the company. In order to engage in smart planning and decision-making, the company would know need to know what these values are. Risks can be 1.) operational, such as loss of supply or access to water, 2.) reputational, such as loss of the license to operate due to some action by stakeholders in response to real or perceived impact by the company on local water resources, 3.) financial, where an increase in the price of water becomes prohibitive to maintain profitability or 4.) legal/regulatory, where a change in laws or permitting restricts access to water or increases costs of treatment. For each of these risk categories, the company should identify all possible scenarios. Then, for each scenario, determine the impact. For example, if a company’s access to a water supply is restricted, they may need to find an alternate source, to develop substitutes or to reduce production. Each of these has an associated financial impact, which can be normalized to production or some other comparative unit of measurement so they know how much water is involved. That new cost can be “added” to the current price of water to get closer to knowing the true value of water. Clearly, not all risks are equally likely to occur. So, to be more accurate, the probability of the risk occurring should figure into the equation. This way, a high value but unlikely situation will be treated differently than a lower financial impact but more likely situation. 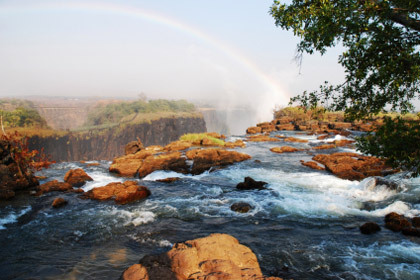 Rainbow falls seen from the Zambian side of Victoria Falls. Veolia’s approach takes all of these risks, their likelihood to occur and related per unit of water costs, and calculates a composite, true value of water. This value is more representative of what water is worth to the company, which leads to smarter planning and decision-making. Of course such approaches are neither foolproof nor totally perfect. However, it gets an organization much closer to an accurate risk-based management approach and does indeed improve decision-making. And to the cynic who still thinks this cheapens the importance of the resource, it is highly unlikely that the true value is less than the current price and cost. So essentially in all cases of going through this exercise, a company will ultimately value the resource more and institute more proactive and sustainable water management practices. They will also work toward lessening their impact and burden on the resource on a broader scale, such as the watershed, that is shared by so many. Finally, by figuring the true value of water into business decisions, it becomes easier to approve sustainable practices, such as water reuse technologies and wastewater resource recovery. This is because the pay back and return-on-investment is not based on a low current price but is corrected for the risk-based true value. Realizing that a low price of water means longer payback periods for capital projects and, hence, greater likelihood of it not being implemented, knowing the true value is better. It is better not only for the company that can be more prepared for risks but also for the society dependent on the resource. Ed Pinero is executive vice president and chief executive officer for Veolia Water Americas. He works to support programs at company operations and to facilitate relations with key stakeholders in regard to sustainability as well as to develop and implement sustainable programs and services for Veolia Water’s clients. The company’s North American operations serve more than 14 million people in approximately 650 communities. Throughout his more than 31 year career, Piñero has worked in the private sector, including as a consultant to many clients on sustainability, environment and energy. He has also served in the public sector as the White House Federal Environmental Executive, White House Council on Environmental Quality, where he focused on developing and implementing sustainability policies and practices within the federal government, and within the Pennsylvania state government in sustainability and energy. Piñero has Bachelors and Masters of Science degrees in Geology. He can be reached at Veolia Water, North America, 200 East Randolph Street, Suite 7900, Chicago, Ill., 60601, or by phone at (267) 207-9622 or by email at Ed.pinero@veoliawaterna.com.